I haven’t updated this space in a while. I keep meaning to, when I’ve taken a “good enough” picture to post here to share. But then, excuses. The sunrises I’ve woken up for haven’t been special; it’s been too rainy… Still, some of the most memorable pictures are taken in these “adverse’ conditions, no? So I need to make a bigger effort. Or at least, share the little captured moments that catch my breath anyway. Here’s one of the marina by our new place this morning (yes, we’ve moved, across the world to Sydney, Australia!). I was on the phone with work in Chicago, when I glanced out the door and noticed that although it was quite overcast, the clouds had a tinge of pink in them. Grabbed my pocket camera, and strode out the door, while still on the phone. 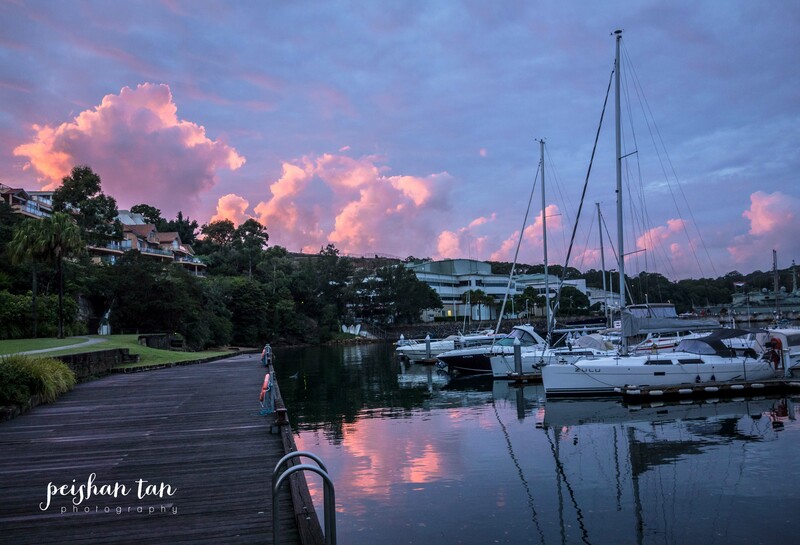 At the marina at the bottom of the hill, the rising sun had just broken through enough cloud cover to cast gorgeous pink and orange hues. It was fleeting though. Within a minute of snapping my photos, the luminance started to fade.